A lot of you have asked for a more detailed view of some of the models I display in my workshop - the older stuff that I didn't film as I made them. So today I've released a video showcasing one of my favourites - the ancient 1/32 Hasegawa kit of the Mitsubishi Zero A6M5. It's a cracker. Even though there are some pretty big faults with this build, the Zero remains one of my favourite completed models. 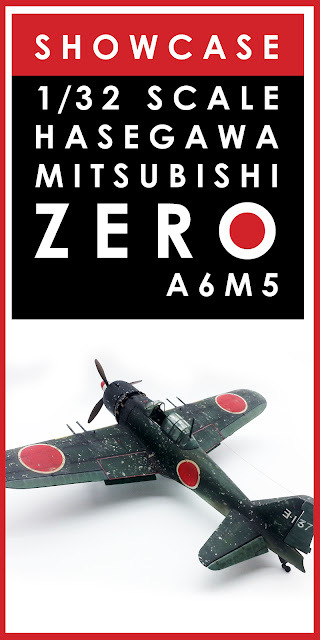 Partly this is because I like the Zero aircraft itself - it's a tough little beast and yet it's lines are simple and elegant, it's very Japanese in that way that they can make things utilitarian yet beautiful at the same time. The second reason I like this build is because it was the first time I ever tried salt chipping to weather the paint job. It was a bit of a watershed moment for me. It's not my best build ever, there are some glaring problems, but it has a special place in my heart. Watch the video - I hope you'll like it.